1. In a large mixing bowl beat 1/2 cup butter with an electric mixer on medium to high speed for 30 seconds. Add 1-1/4 cups brown sugar, baking soda, apple pie spice, and salt. Beat until well combined, scraping sides of bowl occasionally. Beat in egg until well combined. Add 1/2 cup apple juice; beat on low speed until combined (mixture will look curdled). Beat in as much of the flours as you can with the mixer; stir in any remaining flour. Fold in apple. 2. Drop dough by slightly rounded teaspoons 2 inches apart onto parchment paper-lined cookie sheets. Bake in 350 degree F oven about 10 minutes or until tops are lightly browned. Let stand 2 minutes on cookie sheets. Transfer cookies to wire racks to cool. 3. In a small saucepan heat and stir 1/2 cup brown sugar, 3 tablespoons butter, and 3 tablespoons apple juice over medium heat until sugar dissolves. Remove from heat. Whisk in powdered sugar. 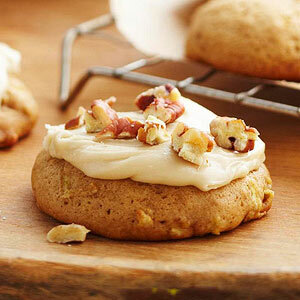 Spread frosting on cooled cookies and immediately sprinkle with pecans. If frosting begins to harden, stir in a small amount of apple juice to make spreading consistency. Makes about 3 dozen cookies.